I preferred the ride from Tustin, because there were fewer places where I had to interface with motorists entering and exiting freeways. When I was in Southern California last week, I was really pleased to find that Metrolink has expanded service in Orange County, so the options for commuting to UCI through Tustin have increased. But despite the new bike cars on the trains and the bike lockers at the station, there is no information at the station for how to get around the area on a bike. Last month, I attended the World Cycling Research Forum at the University of Twente in the Netherlands. Its suburban campus is situated between the towns of Enschede and Hengelo. Both towns have rail stations, and I used both during the conference. There were bike paths connecting many destinations in the area, including the university and suburban office parks. There are a lot of bike paths and bike lanes in Tustin and Irvine, too, but you don't see massive rows of bicycles sitting at the train stations there like I did in the Netherlands. Would some wayfinding signage make bike/ train commuting seem more possible in Tustin and Irvine? 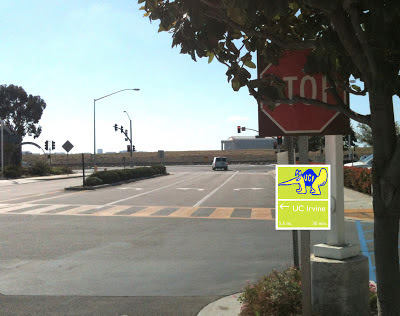 I decided to take some pictures to show the bare minimum points where there could be some wayfinding signage to direct people on bikes to UCI from Tustin station. 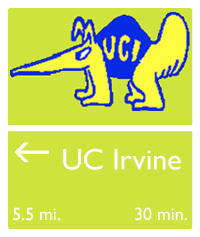 I based this off of the bike wayfinding signs in Portland, with the UCI anteater mascot for fun. When you first pull out of the train station, you make a left onto Edinger Avenue. This island just before the intersection would be a good place for a sign. You ride on Edinger under the Jamboree overpass, where there is a traffic signal. For some reason, the bike lane disappears through this intersection, but starts again afterwards. I was always careful to watch for right-turners here who want to speed onto Jamboree, which is a highway at this point. Two signals up, make a right at Harvard Avenue. This stretch has some of the widest bike lanes I've ever seen, but on the day I was taking these pictures I saw a man riding a bike on the adjacent sidewalk. I think this area is a good example of how infrastructure gets interpreted differently by different people. After following Harvard's gentle curves for a bit, you enter the San Diego Creek bike path by turning right just after the intersection with Barranca Parkway. The bike path has a signpost up already, but nothing to tell you where you're going. I'm not even sure that it's called the San Diego Creek path at this point. Soon you reach a bridge, which you cross and turn right to continue on the San Diego Creek path. This is the longest stretch of the 5.5 mile journey, and I always enjoyed passing through the creek habitat as it changed through the seasons. Many Irvine residents use this trail, too, which is nice. I noticed on this day that an elderly lady stopped and stood to the side as I biked past, acting like I wasn't going to share the trail. I've seen a lot of recreational cyclists biking very fast on these trails, barking "LEFT" as they pass, so I'm guessing she was projecting her frustration with that behavior onto meek little me. For the last stretch, you are biking parallel to University Drive, and you stay on the path till you reach Campus Drive (I don't know who chose these names, but that person is some kind of deadpan comic genius). Make a left onto Campus, and UC Irvine will be on your right. Maybe some urban planner can explain to me why this thing that seems so simple is actually a complicated process that would require years of work to install. Maybe there's already a wayfinding signage project in the works. In any case, it'd be cool to see some signs up or even just spray paint on the ground showing people how to use the extensive network of bike infrastructure in Tustin and Irvine.